It’s a watch that should appeal to a wide range of kids, given its wide range of features. The watch’s positive qualities easily outweigh its flaws, making it a major find in a market that is absolutely full of new gadgets that vary in quality. It features a 1.41? color touch screen with a built-in motion sensor The top of the watch face contains a camera that takes pictures in JPEG (640 x 480 pixels). They can also take quick 60 second videos at 320 x 240 pixels or 160 x 120 pixels at 15 frames per second. The 128 MB of internal memory is able to store approximately 800 photos or 6 minutes of video. Connect the watch to the computer via the included micro USB cable and you will able to transfer files and photos to your computer to store or share with friends and family. The watch is a great choice for children as young as three years old, and older kids up to 6 will also appreciate it. The manufacturer says it is for kids ages 3 to 9 but honestly if your child is like mine, your 7 year old will not be entertained by this watch unless they are using it specifically for the camera and video features. You will need to take in consideration of where your child lays in terms of technology. Fifty different clock face designs are possible with this watch. As such, the watch is very versatile aesthetically speaking, and children can experiment with different looks for the watch. The watch’s screen is a touch screen also, making it a very modern watch with a nonetheless classic appearance. The watch has four different educational games available. Kids can enjoy each and every one of these and explore them in all of their possibilities. Many of these games aren’t going to be available online or on most smartphones, making them rare offerings for kids. VTech’s Learning Lodge is an easy-to-use download manager for Vtech toys. 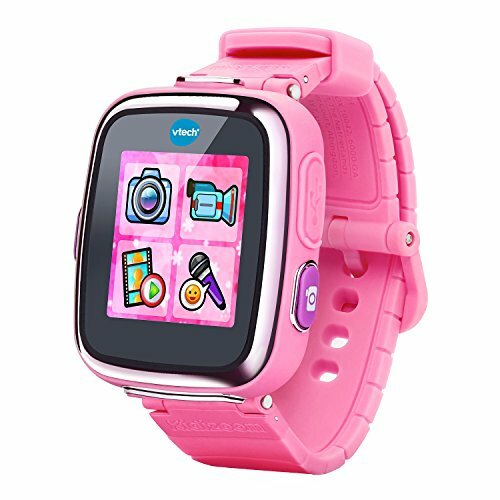 You can connect the watch to Vtech’s learning lodge to download more games and fun adventures. There are some free apps but most are paid. The watch is a great choice for kids that are interested in creating their own videos, and they’ll even be able to add some special effects into the mix. The video camera is high-quality with the ability to take 60 second AVI (Motion JPEG) videos at 320 x 240 pixels or 160 x 120 pixels at 15 frames per second. You can store approximately 6 minutes of video on the watch. Kids can record all sorts of interesting things and experiment with the art of film-making at an early age. On a similar note, the watch comes equipped with a voice recorder that enables voice-changing, which a lot of kids will enjoy. Kids can take pictures in JPEG at 640 x 480 pixels with the watch. They can store approximately 800 photos on the watch. The pictures that they take will be better in terms of quality than the pictures that they can take with many smartphones and similar devices. The camera also comes equipped with photo effects, so kids can definitely take special photos that really allow them to express themselves artistically. Kids are easily able to customize their photos with fun colorful frames, effects, and filters. The watchband for this watch is a fairly classic watchband. It is made of a stong flexible rubbery plastic. It fastens like a belt, and it’s made of the same material as the rest of the watch face’s border. Kids shouldn’t have a difficult time fastening it, tightening it, or loosening it. The watch is is equipped with a nonreplacable, rechargeable long lasting Li-ion Polymer battery. The battery life of almost any device is going to vary according to the usage. For this smart watch, the battery should last for a full day when used extensively. When used more casually, at may last for two or three days. The battery can also be recharged as needed, so users shouldn’t run into any problems. The battery charges quickly and efficiently. The Kidizoom is splash proof and sweat proof, however it is not waterproof. Your child should not wear this to take a bath or go swimming. Do not submerge the watch while washing hands.